October 22, 1830 deed where Aaron Pressey Gould of Haverhill, New Hampshire, purchased land at Piermont, New Hampshire, from John Osgood, also of Haverhill, New Hampshire. The land purchased was part of the larger lot described by a the number thirty-eight and a word I can't decipher: Hawes, Hasson, Hanson, etc. The deed was witnessed by John A. Page and Samuel Cartland; the latter also signed as Justice Peace. The reverse shows the signature of John Page, Reg., presumably Register of Deeds, who may have been John A. Page. John Osgood of Haverhill, New Hampshire may have been the noted clockmaker John Osgood, who was born June 20, 1770 at Andover, Massachusetts, son of Col. John Osgood and second wife Huldah (Frye) Osgood. Col. Osgood died about a year after son John's birth, leaving his wife to rear children from two marriages all on her own. Read more about clockmaker John Osgood here in a wonderfully illustrated biography by Donn Haven Lathrop. Another biography of John Osgood (1770-1840) is shown on the Delaney Antique Clocks website. On March 4, 1797, John Osgood married Sarah Porter, a Boxford, Massachusetts native whose parents had moved the family to North Haverhill, New Hampshire. John and Sarah would have six children, including son John Osgood, born May 29, 1798 at Haverhill, New Hampshire, who is another possibility for the John Osgood mentioned in the deed. Intriguingly, both biographies mention a farm owned by John Osgood (1770-1840), in addition to his village home and workshop. This farm was located on the eastern side of town and was managed by William Porter, a brother to John's wife Sarah (Porter) Osgood. Perhaps the parcel covered by this deed was part of that farm. Clockmaker John Osgood died July 29, 1840 from consumption. Nothing on the bottom half of the reverse. Aaron P. Gould was presumably Aaron Pressey Gould who was born in 1808 and died in 1882. A record in the collection New Hampshire, Death and Burial Records Index, 1654-1949, indicates that Aaron P. Gould, age 74 and widowed, died in June 1882 at Piermont, New Hampshire. A mention in the book The Family of Zaccheus Gould of Topsfield, by Benjamin Apthorp Gould and published in 1895, gives Aaron's birth date as March 29, 1808, his death date as June 25, 1882 and his middle name as Pressey. He was the son of Amos and Rebecca P. Gould and was a postmaster at Piermont, New Hampshire. Another death record in the collection New Hampshire, Death and Disinterment Records, 1754-1947 indicates that Aaron was born at Canaan, New Hampshire, and that he died of kidney disease. A record in the collection Vermont, Vital Records, 1720-1908, shows that on January 1, 1833 at Bradford, Vermont, Aaron married Hannah Jackson. An entry in History and Genealogy of the Perley Family, compiled by Martin Van Buren Perley and published in 1906, gives Hannah's parents as Jeremiah Jackson and Annie (Niles) Jackson. Hannah died in 1881. See another post that features the $1000 bequest left by Aaron Pressey Gould to the Parsonage Building Committee of the Congregational Church at Piermont, New Hampshire. Samuel Cartland was presumably the Samuel Cartland who was born at Lee, New Hampshire, in 1791 [or 1797 as noted in the except below], possibly the son of Elijah and Abigail Cartland. Samuel graduated from Dartmouth College and served two terms as president of the New Hampshire Senate. 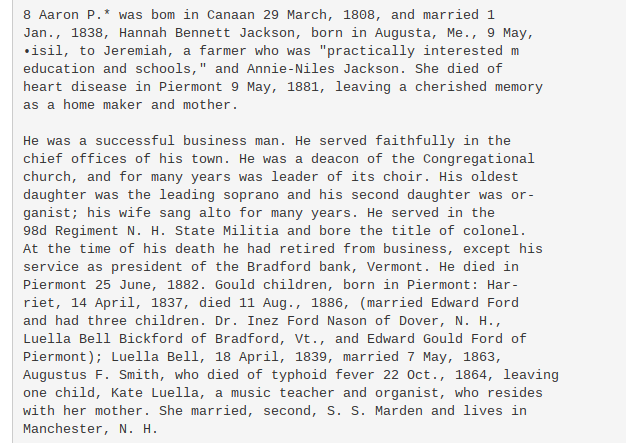 The excerpt also notes that he died in Maine in 1840, but I'm not sure of that date either, as there is an Hon. Samuel Cartland, born in 1791 and who died in 1852, buried in the Crowell Cemetery at Exeter, Maine. John A. Page was presumably John Alfred Page, born June 17, 1814 at Haverhill, New Hampshire, son of future New Hampshire governor John Page and Hannah (Merrill) Page. John A. Page married Martha M. Ward in 1839. He was a merchant and banker at Haverhill, New Hampshire, and later a bank president in Vermont. He died in 1891. His biography also appears in the History of the Town of Haverhill, New Hampshire.